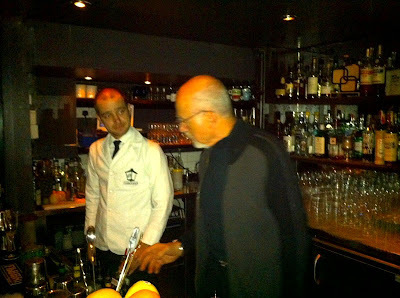 Whilst a guest and close friend of the bar with no name, Peter is also deservedly well known as a Bartending Guru, so it was to him we turned for help on perfecting the White Lady cocktail. A simple combination of Gin, lemon and triple sec, bound together with egg white, it requires a delicate balance to ensure all the flavours are in harmony, and who better to demonstrate this than Mr Dorelli himself! Needless to say, it was a special experience, and Matteo was on hand to assist in a faultless and unforgettable lesson in the nuances of the drink. Our thanks!